﻿﻿Our laboratory is broadly interested in understanding the structural basis of signal transduction events that occur at the membrane surface. These events involve reversible association of signaling proteins with membranes in response to different sti﻿﻿muli. One of the key kinases regulating these signal transduction pathways is the Protein Kinase C (PKC) family that comprises conventional, novel, and atypical isoforms. The enzymes have multi-modular structure, with the N-terminal domain primarily responsible for interactions with membranes, and the C-terminal domain responsible for catalysis. The cytosolic form of PKC is maintained in the latent conformation through an auto-inhibitory interaction between the pseudo-substrate region and the active site of the kinase. The enzyme translocates to endo-membranes in response to interactions with second messengers generated in the upstream signaling event. The membrane association step is accompanied by a large-scale conformational rearrangement of the protein that relieves auto-inhibition. We are interested in the structural and dynamical basis of this process. Many proteins involved in signal transduction share the multi-modular architecture of PKCs, where flexible linker regions connect individual protein domains. The linkers ensure conformational plasticity of the signaling proteins and enable them to interact with a variety of protein partners and membrane-embedded ligands. The individual protein domains, each having a highly specialized function, enable a complex and nuanced response to different stimuli generated in the cell. This multi-modular architecture presents both challenges and opportunities for structural biology work. X-ray crystallography has provided numerous high-resolution crystal structures of the individual protein domains in the apo- forms and bound to soluble ligands. However, crystalline picture does not adequately capture the dynamic landscape of highly flexible protein systems, and oftentimes incorporation of lipid ligands is difficult. Nuclear Magnetic Resonance (NMR) spectroscopy offers unique advantages in the following three areas: (1) probing weak protein-ligand interactions; (2) characterization of dynamics, both intra- and inter-domain, the latter manifested in the domain rearrangement within a host protein; and (3) probing the geometry of protein-membrane interactions, through incorporation of suitable membrane mimics. Overall, a multi-faceted biochemical and biophysical approach is required to gain insight into structure, dynamics, and function of these complex signaling systems. The N-terminal domain contains three globular protein domains: conserved region 1 that occurs in tandem (C1A and C1B), and conserved region 2 (C2). C1 domains are responsible for interactions with diacylglycerol. 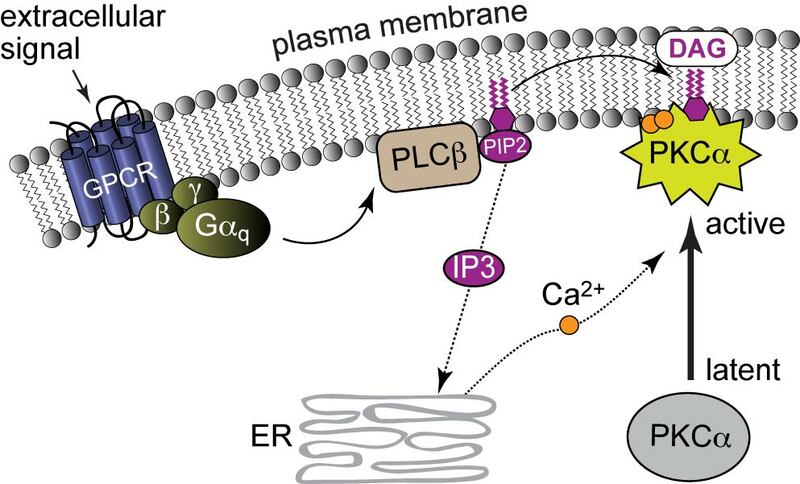 C2 domains in conventional PKC isoforms are calcium sensors that interact with anionic phospholipids upon calcium binding. Our objective is to determine the structure of the entire regulatory domain in solution, the geometry of its interactions with membranes, and the role of flexible linker regions connecting the domains. C1 domains are zinc finger domains that occur in many signaling several signaling proteins that are targeted to diacylglycerol-containing membranes. C1 domains are promiscuous: in addition to binding their native activator DAG, they engage in high-affinity interactions with a number of naturally occurring compounds. Of those, the most well known and widely used are cyclic diterpenoids, phorbol esters, that are known tumor-promoting agents. Other distinct features of C1 domains are their amphiphilicity and a dynamic nature of their ligand-binding cleft. The objective of our studies is to determine structural and dynamical basis of ligand promiscuity and understand the influence of different ligands on protein-membrane interactions. response to binding calcium, these domains target their host proteins to membranes that contain anionic phospholipids. C2 domains are not simple electrostatic switches: they interact with membranes in a complex and nuanced manner, with metal ions directly involved in coordinating the oxygen atoms of lipid head groups. Toxic metal ions such as Pb(II) and Cd(II) are known to interact with C2 domains and thereby interfere with their normal signaling response. The objective of this project is to understand the influence of these non-native toxic metal ions on the structure, dynamics, and function of C2 domains. The experimental approach includes project makes use of NMR, X-ray crystallography, and fluorescence spectroscopy. Variable-5 (V5) domain is the most C-terminal domain of PKC. As suggested by the name, it is the most variable domain of all PKC isoforms. Because of its variability, V5 is an attractive target for modulation of PKC activity in isoform-selective manner. We demonstrated that in the isolated form V5 does not have a stable secondary structure and can be defined as intrinsically disordered. It has a moderate amphiphilicity and propensity to partition into the hydrophobic environment. Functional studies indicate that V5 plays an important functional role in PKC by serving as a protein interaction module, both intra- and inter-molecular, and as a substrate for a peptidyl-prolyl isomerase. We are using an inter-disciplinary biophysical approach to obtain atomic-level information about these interactions.